Let O be the circumcenter of ΔABC. 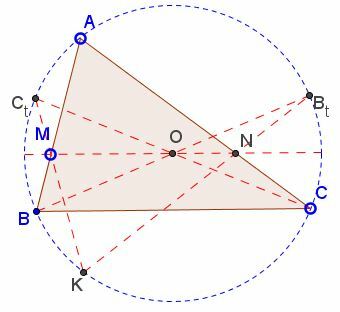 A line through O intersects the sides AB and AC at M and N, respectively. Let S and R be the midpoints of BN and CM. respectively. Prove that ∠ROS = ∠BAC. The problem is easily solved with a variant of Pascal's Hexagram Theorem. This is how. Let BBt and CCt be two diameters of the circumcircle. First, observe that a homothety with center B and coefficient 2 maps O to Bt and R to N. It follows that OR||NBt. Similarly, OS||MCt. Let Bt and MCt meet at K. The proof is based on the fact that K lies on the circle. This may not be immediately obvious and I deal with this assertion on a separate page. ∠BOR + ∠COS = ∠BAC. The fact that K lies on the circle is a special reformulation of Pascal's theorem.